100% washed and printed linen - REVERSIBLE Rose prints / Chalk solid . 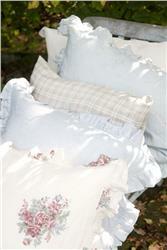 - Romantic bed linen with a soft touch. Perfect for a cottage interior or to create an English country atmosphere. Soft roses in OLD RED, BLUE and GREEN shades on a CHALK background, complementing our other new collection of linen bedding ABBEYWOOD. Duvets have a hidden button closure - Shams have a gathered flounce. Available in duvets, shams and pillow cases. Santiago in OLD ROSE - OLD DENIM and CHALK. SANTA CRUZ blankets in CHAMBRAY color. Napoli Vintage decorative pillow covers 20" - 25" square.